The kids are always asking me to tell them funny stories from when they were little. This is a good place to put some of the funny things I have observed over the past month. Here, we have Gavin wearing Ricky’s basketball shoes and trying to make a serious “baller” face. Winter grew out of her puppy crate. The new crate is pretty big because I’m not sure how much she will grow. It’s big enough for Ricky. So if he’s bad, he can go sleep outside with her. Brooklyn is taking swimming lessons from one of Makayla’s friends who comes to our house and teaches her in the afternoons. Brooklyn was so excited for the first lesson, she sat on the front porch like this for a half hour watching for her teacher’s car. Here’s another funny story from Brooklyn and Andrew. Do your kids wipe boogers on the wall or sides of the couch or car? It’s disgusting!!! My older sister did this. Emily used to have a nice collection on the wall by her bed . . . gross! I wonder if she has any on her wall at BYU. Not all my kids have this disgusting and very inconsiderate habit, but Andrew does. When I found a new collection on the wall near a light switch, I berated him. Andrew claimed innocence with all kinds of excuses. I call him my excuse arsenal. He even tried to blame Brooklyn! Gross. And funny. But mostly gross that we even had to have this conversation in the first place. Gavin got my phone during family scripture study and took about a hundred pictures. These are a couple. I tried to talk him into a more practical tan hat, but he was in love with that one. He wore it proudly all week. He’s a funny guy. While Ricky was backpacking, Rick and Makayla were at girls’ camp. Rick took the big van, so because I had less kids, I took the little black car around town. At the grocery store, we spotted a small plastic pool that would work to help keep Winter cool (she’s scared of the big pool and we don’t really want her dog hair plugging the filter). I bought the pool before thinking about how I would get it home in the little car with four kids. We made it work . . .
And she loves it. We had been spraying her off with the hose a couple of times a day, but this works better because if she’s hot, she just gets in all by herself. Later that evening, the kids talked me into taking them to the park as the sun was going down (I refused to go any other time of the day because it’s too hot). Andrew and Brooklyn tried out the baby swings. Andrew has been begging me to take them to this park for a long time because he loves this spinny thing. He talked Sean into climbing up there with him and begged me to spin them fast. I warned them that it might make them feel sick. Sean was worried, but Andrew kept goading him on. After the big spin, Sean had to have a long rest. A couple of days ago, Gavin showed up in the kitchen dressed as a “bad guy,” complete with a fierce weapon. I was successful at dodging his jabs with the spoon. Attention from others makes me uncomfortable. Well, certain attentions are ok–the quiet kind like thoughtful notes or one-on-one compliments or personal expressions of gratitude. That kind of attention is great–even uplifting. I don’t like the kind of attention that comes from a crowd of people. You know, like when your friends sing you Happy Birthday in a crowded restaurant or when you are presenting one side of a debate in front of opinionated classmates, or when your name is called for an award and everyone swivels in their seats to look at you as you walk toward the podium. I was both dreading and anticipating the day Rick’s calling would be announced. It would be a relief not to keep things quiet anymore and Rick could move forward with some of the “Bishopy” things he needed to do without drawing suspicion. But I was not looking forward to the moment when the Stake President would say, “Rick Mergenthaler as Bishop of the Iowa City 1st Ward,” and every head would turn to look at him. I knew they wouldn’t be looking at me, but I still wondered how to react. Should I look at him in surprise and awe? Could I summon a look of complete adoration? Maybe I should look down at my lap in humility. Should I smile? That might be creepy. Besides, who would I smile at? I know I was overthinking and now that I’m writing about this, I honestly can’t remember what I did when the call was announced. I probably missed the moment because I was busy helping 3-year-old Sean dry the sacrament water that spilled on his shirt (he used to freak out about anything on his clothes–even water). What I was dreading more than the actual announcement was speaking in front of the ward. I knew I would be asked to bear my testimony. When I was a teenager, I was horrified at any speaking assignment. I would hide in the bathroom at school and take a failing grade on the assignment rather than actually present anything in front of the class. When assigned to speak in sacrament meeting, I’d read a short talk from a paper at the podium without looking up because if I looked up, my nervousness would cause my head to shake like a palsy patient. Over the years, with practice and positive speaking experiences, I have learned to be better at public speaking. I might even count it as a strength if I am able to prepare. But I had no idea what I would say on this occasion. It turned out that my children gave me plenty to talk about. I can’t remember the order of the speakers or what anybody before me said. When it was my turn to “make some remarks,” I handed baby Brooklyn off to Emily and headed up front. I began my remarks by thanking our previous Bishop who was so generous and kind. As I spoke, I noticed the star stickers on my arm placed there by Sean in a neat row from my wrist to elbow, and my thoughts of the past few weeks came back to me. “The story is kind of funny, but it helps to illustrate some of what I feel about Rick serving in this capacity. We have had a long time to think about what this would mean for our family, and I have had some worries. I don’t doubt that Rick will be inspired to help others in very specific ways. I know you can trust him to guide our ward and help you individually as needed. He has been prepared for this calling. He will learn as he goes and the Lord will help him, but I have no doubts about his capacity to serve or his ability to receive revelation in this specific calling. I closed with my testimony and exited the stand. Phew! At least that part was over. So, what do you think is the most appropriate response to congratulations in this circumstance? I think a quiet expression of gratitude works best. And be happy that people care enough to express their love and support. That first Sunday as the Bishop’s wife was long and stressful, but there were also a few small I should record (besides, of course, the diaper idea which was also a small miracle). First, a man who Rick had been home teaching for years came to church for the first time in over 20 years because he loved Rick and wanted to support him. The man didn’t know that Rick would be called as Bishop (though he may have had suspicions). On a visit a couple of weeks before Rick had told him that this particular Sunday was going to be a big day for him and it would mean a lot if this man could be there. It was very special to see him there with his family who had been attending church without him for so many years. But it was even more touching to know that this man cared for Rick like a son. Rick’s dad couldn’t be there, but this man was. He loved Rick enough to put aside any doubts he had about the church or any awkwardness at attending after being away for so many years. Another small miracle happened during the meeting to set the new Bishopric part after church. We met in the high council room with our families. After three hours of church, I didn’t know if the younger children could sit reverently with arms folded and heads bowed during four priesthood blessings. I especially wanted to hear what was said in Rick’s blessing because I wanted to be aware of how I could help. I also didn’t want to be disruptive to the other families there who would be doing their own part in supporting their husbands in demanding callings. I was pleasantly surprised, though, when the baby was calm and the kids sat and listened to all the discussion and stayed peaceful and respectful during the blessings. Those two small miracles were just the beginning of the many blessings our family received during Rick’s service. Even when things were hard, miracles happened, inspiration came, and we were able to move forward with our responsibilities and thrive in difficult situations. I’m going to throw a couple of pictures on here just for fun. About a month after Rick had been serving as Bishop, we celebrated Ricky’s and Andrew’s birthdays on a Sunday evening after Rick got home from meetings. This doesn’t seem like that long ago, but I can’t believe how much Ricky has changed!! It’s hard to tell the story of when Rick received the call to be Bishop without telling some of what was going on with our family at the time. If you look back through our blog history, you’ll see I get quiet from 2010 through 2017. During those years, I spent much of the time in survival mode. I only documented large trips or events–if that. Mostly, our family blog was a place to put pictures. My personal journal writing is also kind of sparse. I did write, but mostly when I was upset or worried about something. Writing in my journal was a way for me to think through things. Because of this, there is a tone of negativity in a lot of the entries of those years. That isn’t to say there wasn’t joy or good times. Like I have said before, there is always opposition. I just didn’t record as much of the joy as I should have. So, what was going on with us in the spring of 2013? Brooklyn, our 6th baby was a newborn–a difficult newborn. She cried every time she was in the car–especially in the evenings. She refused pacifiers, so comforting her quickly was difficult. She didn’t sleep well at night. Rick’s job was very demanding. He was approaching tenure and the timing was right for him to “get his name out there” as far as collegial notoriety. More experienced faculty encouraged him to present his research at several universities. Often, when presenting your research, the visit is structured somewhat like an interview. The presenter meets with leading faculty and sometimes job offers arise out of this process. We were strongly considering moving “up” to a more prestigious university at this point in Rick’s career. He had strong opportunities at a couple of schools and he was very close to accepting an offer at Dartmouth in New Hampshire. That is until I had a very distinct dream in which I was helping Rick write a letter to Dartmouth declining the job offer with very clear and inspired reasoning. Basketball season was just winding down. Emily played high school ball, and Makayla, Ricky, and Andrew were played with AAU or YMCA teams. Sean had also participated in a Saturday basketball class. With the end of a very busy basketball season, Ricky wanted to give baseball another try. At this first practice, he caught a baseball in the mouth. I was serving in the Stake Primary Presidency as 1st Counselor. Yearly ward conferences were scheduled in the springtime, so many Sundays found me and Brooklyn traveling between 30 minutes and 2 1/2 hours to visit wards and branches in the stake. One very difficult week towards the end of March, little Brooklyn got her first cold. The congestion from the virus caused her to have an eye infection which she kindly shared with me. I had conjunctivitis in both eyes. The swelling, itching, and mucus were so bad that I had to wake Rick at night so that he could bring me the baby to feed her because my eyes were crusted closed. At the tail end of this double eye infection, Brooklyn and I attended a branch conference in Belle Plaine, Iowa. Though medication had cleared my infection, I did not yet have new makeup (I threw the old stuff away to avoid reinfecting myself). The dark circles under my eyes were evidence that Brooklyn still wasn’t sleeping well. I looked hideous, but I was well enough to go to the conference. Just before sacrament meeting, President Hansen casually said, “Hey, I need to meet with you soon. Maybe when I get back in town, I’ll call you and set something up.” I said, “OK.” I was pretty sure I knew what this was about. Our sweet Stake Primary President had served a good tenure and had experienced a shoulder injury making her service very difficult. I thought the Stake Primary Presidency would be reorganized soon and I would be released. A few weeks later, President Hansen called me to schedule the appointment. He asked that I bring my husband along. With the request to bring Rick, I wondered what this interview might be about because a simple release from my calling would not require Rick’s presence or approval. I teased Rick that he needed to practice being more supportive of me in my callings because something was on the horizon. At the appointment, President Hansen called me in first. He asked about our family and how things were going. I was honest, but not pessimistic. I told him we were well, but I was tired. Our 6th baby was our most difficult (that’s because I hadn’t had the 7th yet). After our short conversation, he called Rick in to speak with him. Last, he called us both in together. It was a letter from the First Presidency of the Church of Jesus Christ of Latter-day Saints stating their approval to call Richard Dean Mergenthaler Junior as Bishop of the Iowa City 1st Ward. We were completely blindsided! I laughed awkwardly saying, “Well, you’re tricky! We thought this was about me and my Primary calling!” I felt sheepish for teasing Rick about being more supportive because it was actually me who would have a lot of supporting to do. And that was that! The rest of the interview was mostly sharing information. We found out that the change wouldn’t happen for nearly a month. Meanwhile, Rick was to pray about counselors, talk to the current Bishop, study, and prepare. Those weeks before he was set apart were hard. We didn’t say anything to the kids until a few days before, but Rick’s absent-mindedness, intensive studying, and hushed conversations hinted that something was up. Our older and more observant children picked up on the change in home climate. The week after he learned of the call was General Conference weekend. Usually, we enjoy listening to conference together and doing something fun and active in between sessions. Rick was severely focused on reading in Handbook 1 about the duties and responsibilities of a Bishop and was very difficult to draw out. I played with the kids while he studied indoors. He spent his 36th birthday on a campout with the Young Men instead of with his family because in his preoccupation he didn’t realize the double commitment. A few weeks later, a friend of ours observed that he seemed pretty distracted on that campout, but he couldn’t pinpoint the reason. I don’t think this distraction or absent-mindedness is specific to somebody who is preparing to serve in a challenging calling, but I do think a calling like this can weigh heavily on a person–especially when so much is unknown and new. Rick’s personality especially leans in this direction. 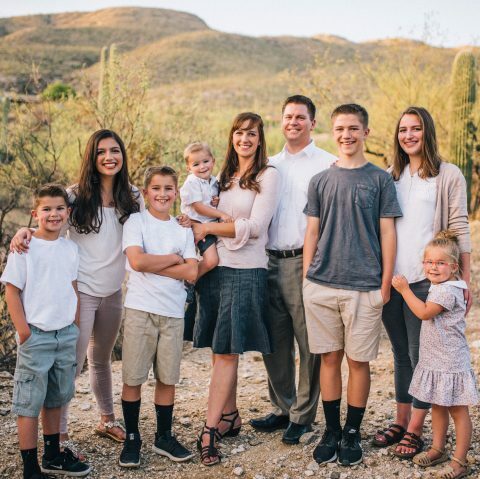 He recently accepted a calling to serve on the Stake High Council for the first time, and in an effort to serve well has been a little distracted, but not nearly like he was as he prepared to serve as Bishop. I didn’t tell anybody. I’m good at keeping things quiet. Even my close friends rarely know when I’m struggling. Usually, only Rick bears the brunt of my worries and stresses (too bad for him). I’m not a whiner and I don’t open up about challenges too often. On the surface, everything went on for me as it normally would. One friend was pretty upset at me for not sharing, but she’s kind of a “talker,” if you know what I mean. I didn’t want any hurt feeling or confusion because I wasn’t careful about what I said. This ability to keep quiet was needed multiple times throughout Rick’s tenure as Bishop. Most of the time, I didn’t know what was going on, and some of the time I pretended I didn’t know what was going on. Though I didn’t talk much, I thought plenty. One sacrament meeting, when the kids were especially peaceful, I looked over at Rick holding the sleeping baby and thought, “He will never be able to hold Baby B in sacrament meeting again.” On Sunday when he escorted Sean out of sacrament meeting to use the bathroom, “How am I going to do this on my own? Who will sit with the kids when I have to feed the baby? Will I have to traipse out of here with a trail of children?” I also mulled over the worries I listed in the first Bishop’s Wife Life. Consider this picture I found taken about the time Rick received his call. Each of the facial expressions probably matched my own throughout the process. Emily looks dazed–like no matter what you say to her she will stare back, stone-faced. Makayla is annoyed. Ricky is surprised and confused. Andrew has a slight smile, like “Is this a joke?” Sean is confident and happy despite the odd situation he finds himself in. I knew that supporting Rick in this calling would be hard for our family, but the challenges were as temporary as the spots the kids painted on their faces. I also knew we would come away from the experience much better off than when we started–because when you start out like we did, there can only be an improvement.